Smiles Dental Clinic in Ireland is the generous sponsor of this clinic. It is March 19th. It is Saint Joseph feast celebrated by many Christians around the world as Patron Saint of workers. 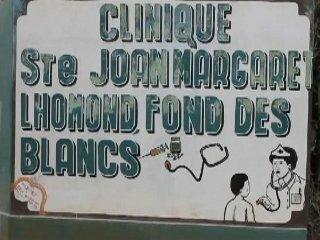 Also, this Wednesday, March 19th was chosen to celebrate the first year of dental work at Ste Joan Margaret Dental Clinic in Lhomond sponsored by Smiles Dental Clinic in Ireland. It is 9AM, the food and beverages are ready! We receive some patients at the Clinic and we invite them to spend some time with us to celebrate our first year of dental service in the community. Some people in the community have also been invited to this special event. At 11:35, Mr. Ferel, the Coordinator, broke the ice by starting with the history of the Center while he put emphasis upon the dental clinic. He seized the opportunity to thank everybody in the community who have helped him to create this Center. Then he asked Dr. Joseph, the dentist, to explain what he is currently doing at the dental clinic and how he finds the community. After that, Mr. Ferel invited the guests to share their experiences at the dental clinic. This provides a way for the community to give feed back about the quality of service they are currently receiving at the clinic. They encourage Mr. Ferel to keep up the good work. In the end of this wonderful event, Mr. Ferel gave a big thank you to Dental Smiles in Ireland for the support they are giving to the community of Lhomond, Fond des Blancs. and invited everybody to eat lunch. We ate chicken and plantain (Haitian creole: poul ak bannann)and some beverages. We spent a great time and we appreciate the participation of the community in our projects to impact the quality of life of thousands of people. We are working hard to celebrate many many more years!